Our Pretzel wreath* is ready for your get together and is just right for delighting guests of any and all ages. Serving-sized chocolate covered pretzels are loaded with colorful jimmies to add a festive air. Featuring Dorothy's amazing Swiss chocolate. 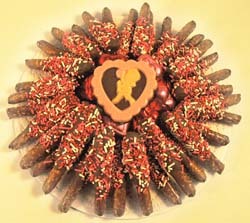 Pretzel trays can be designed for any holiday or occasion!